Nikwax has won a Queen’s Award for Enterprise in Sustainable Development! We’re amongst just 13 companies across the country this year to have received an award in this environmental category, so we’re immensely proud of all our hard work that led to this achievement. We make every effort to minimise our impact on the environment and people’s health, and this Queen’s Award has been achieved through our demonstration of sustainable practices over the past five years. In our fight against the harmful chemicals used by other brands in the waterproofing of outdoor gear, all Nikwax products are WaterBased, solvent free, non-flammable and do not use aerosols. And, did you know, we’re the only aftercare company in the world never to have used fluorocarbons (PFCs), as these hazardous chemicals persist in the environment and can have serious health implications for humans. Our products have consistently been shown to outperform the competition, demonstrating that solvents and harmful chemicals are simply not required. We go over and above the current legal restrictions on chemical use and publish a list on our website of the chemicals we prohibit. Our waste reduction programme has seen the amount of waste we recycle go from 16% in 2006 to 71% in 2013! We have a target this year of 80%. We continually strive to increase our renewable energy generation and in 2011 we installed a 7.7 kwh solar panel system to our main office unit. During the summer months this provides that building’s entire electrical usage. We also harvest rainwater from our manufacturing plants roof space to use in the production of some of our products. Nikwax is carbon-balanced through the World Land Trust (WLT). We’ve been calculating our primary carbon dioxide emissions since 2007 and every year since then we’ve offset those emissions, plus an estimated figure for pre-2007. So far, we’ve contributed around £50,000 to carbon-balanced WLT projects and that has supported the purchase and protection of several threatened habitats across the world. In addition to a donation to cover our carbon footprint, we make a matching donation for use in the WLT’s most urgent appeals. 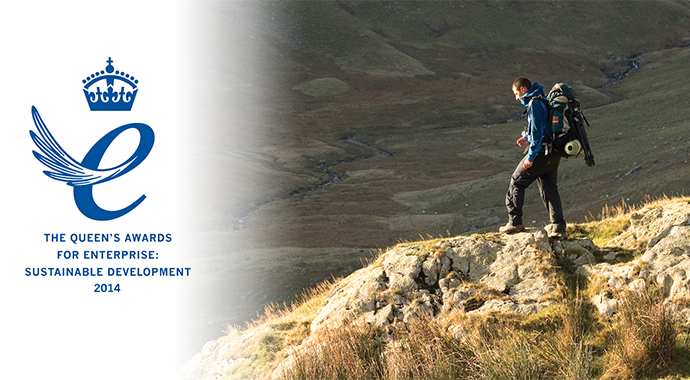 Nikwax founder, Nick Brown, is Vice President of the European Outdoor Conservation Association (EOCA). As part of this Nick campaigns for environmental responsibility and best practice within the industry, by supporting conservation funds, raising awareness of climate change and challenging the continued use of hazardous chemicals. We like to support our local community where possible, giving lessons in schools on science and sustainable business and recently donated £3,000 to a nearby primary school to enable them to build an outdoor science classroom. We also offer grants to environmental projects in the UK and abroad. We don’t like to hide anything, so we post reports on our website each month that include figures for our energy use, packaging and carbon output, dating back to 2009. Achieving a Queen’s Award for Enterprise in Sustainable Development is testament to both our superiority in environmentally-friendly waterproofing technology and its commitment to delivering sustainable business practices. But it doesn’t end there! We have a goal to become waste and landfill free in five years and plan to further develop our rainwater harvesting to encompass a larger percentage of produced materials.